Gosh, I have just been so busy. I thought being unemployed would mean some time to relax, and I have had time, but damn have I also ben running around making plans and taking odd jobs and whatnot. So after I got over the initial anger and depression that comes with being let go from a career, salary, benefits, and whatnot, I began truly thinking and realized that yes, while the career and security were great, the world was my oyster. I could do anything I wanted. I got my degree in graphic design and I am very happy to have that degree. I will never regret the work I put into it, and I will never forget the joy of walking across that stage in my cap and gown. But, I was never passionate about graphic design. I took a hobby and turned it into a career, something I’ve heard you should never do. The one thing I have always been passionate about is writing. I have been writing since I learned the alphabet and could hold a pencil. From poetry to novels, I have written it all. So I started looking at writing jobs. I knew it would be difficult, but graphic design does technically fall under communications, so I also knew I had a chance. I replied to a part time job on Craigslist. I heard back from them within a few hours and, after a video interview and some writing tests, I would like to unofficially announce that I was offered the job! Doors close, and they open. Tragedy can blossom into opportunity. The other door that is closing is one I am a little bit sad about…at the end of May, I am going to move back to Charlotte. Even though I did get the job, it’s part time and I cannot continue to afford living here. My best friend will be renting me a room in her beautiful new house for a much more affordable price. I’m excited, and scared, but mostly excited. I cannot wait to see what this new journey holds for me. I’m going to miss the beach and the friends I made here, but my gut is telling me to move on. Move forward. This is not the place where I am meant to grow. So, I will be writing, and hopefully blogging more! I have some ideas for Unless, and I can’t wait to get started on this new life! I was going to update my blog this weekend with a post about a new endeavor, but I feel this takes precedence. We are all aware of hurricane Joaquin, and being on the coast is no joke right now. I am more inland, which is keeping me much safer than I would be a couple miles out. That being said, this is a legit disaster and five people have already died in Columbia, SC, where one of my closest friends lives. The pump station across from my complex has been issuing a siren for the past two hours, something I’ve never heard in the year and a half I’ve lived here. Make sure you have adequate food and water, flashlights, batteries, and keep everything charged. Now that I live in Wilmington, I’m really excited to get involved with the volunteer opportunities here. And, in light of my determination to go green, reduce my carbon footprint, and help save the planet, Justin and I sacrificed sleeping in this Saturday to help with the Cape Fear River Watch. Wilmington natives are most likely familiar with this awesome opportunity, but for anyone who isn’t in Wilmington, River Watch is an organization that helps with water and river quality. This particular volunteer program cleans trash out of rivers and riverbanks. I was really excited to see quite a few people there, including my coworker/good friend Allie and her boyfriend Nick! Sticks, bags, and gloves were provided for us. 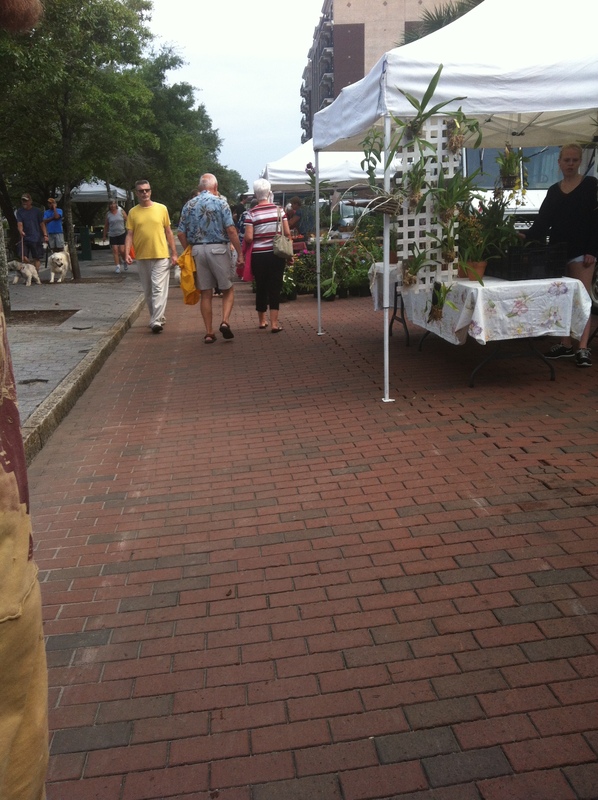 Below are some photos from the morning, taken by Bernie, our motivated and awesome organizer, and Allie! Clicking on the photos will take you to the Cape Fear River Watch Website. We got what we could! There’s still more trash that we couldn’t reach even with the long grabber sticks. This photo unfortunately doesn’t showcase every awesome person who came out. We all kind of got separated and cleaned different spots. I felt really, really good after this morning! My soul felt good, my body felt good…all was good. 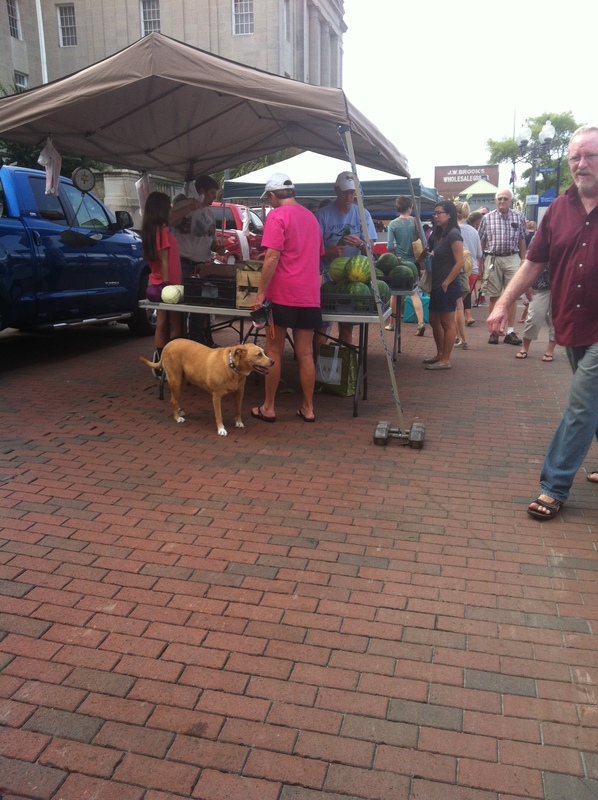 After, even though we were wet and soggy, Justin and I hauled over to the Cape Fear Farmer’s Market and we picked up some homemade goat cheese, organic cat nip, corn, okra, rosemary and thyme to plant in pots on the porch, and organic ground goat. The vendors were drool-worthy. I wanted some of the homemade bread but I’m still on a bit of a budget (haven’t gotten my first paycheck yet) so I’ll have to wait, it was a wee bit pricey. But when I have the money, I’ll be purchasing a hand-woven basket, some beeswax candles, and other goodies I can’t wait to get my hands on! 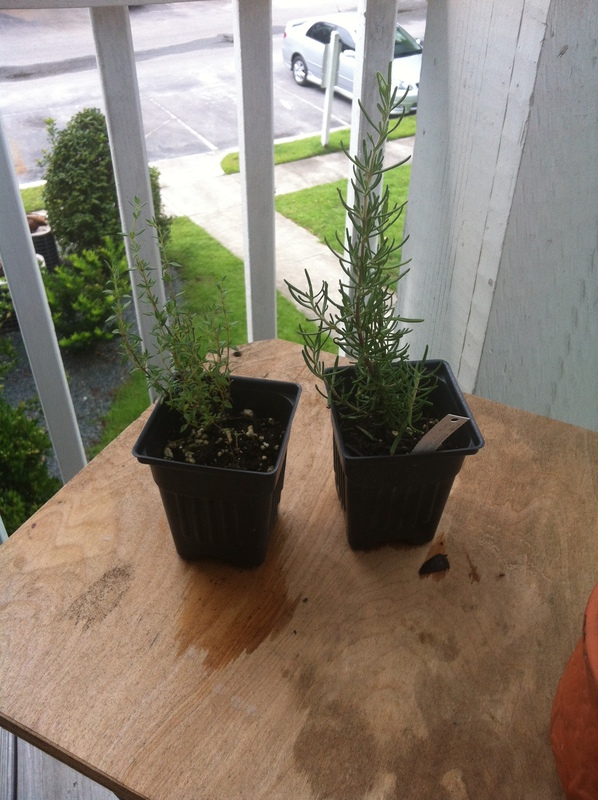 This is my French thyme and pink rosemary! I wanted to buy out the whole herb vendor. The lady’s prices were amazing and she was so kind and very helpful in giving me advice to start my porch garden. Since taking this photo I have potted the herbs, thanks to my awesome neighbor Angie who has a thriving porch garden! I actually may have a few more posts born of this weekend. Since our apartment is lined by a bamboo forest, Justin went and foraged some fallen stalks and is currently making them into some sunshades for the porch a gate for the porch! And I’m hoping to experiment with some lip balm making supplies I have but never used! That’s it for now. I hope everyone is having a wonderful weekend!